Well it finally happened, there is absolutely nothing on my TiVo. I’ve watched everything that I recorded. I copied shows to DVD that I want to keep. 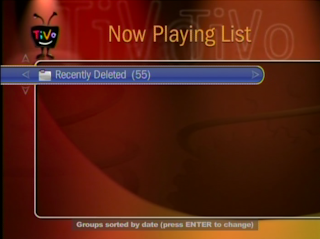 And now the TiVo is completely blank. I’m thinking of running the “delete everything” feature and rebuild my season passes. This is the first time I’ve hit the bottom since I got the TiVo in March 2003 so I’m not expecting this to happen again for a while. Not only is the TiVo blank, the eight year old DishPlayer died a third and I think final time so I don’t have any shows on that DVR either. To compete the emptiness of content, all my NetFlix disks are either coming or going today, nothing at home. I feel weirdly empty today, like when you take a really, really big poop. I dropped Lohan and Richards off my TiVo. They were both too incredibly, painfully, ignorantly stupid to watch. Not only that, I'm automatically boycotting anything the younger Lohan girl does because of the two episode I've seen.